Often considered a minor pathogen, angular leaf spot caused by the bacterium, Xanthomonas fragariae, can cause serious leaf and calyx infections ruining the marketability of fruit if left uncontrolled. Like all bacterium, the pathogen will infect leaves and the calyx through natural openings or wounds. Infections can often start in production operations and come in on infected bare root transplants or cuttings. Symptoms on leaves include initial small, irregular water-soaked lesions (Fig. 1). Angular leaf spot is popping up throughout southern New Jersey. With the cool, wet weather and isolated rain, the conditions for its development and spread have been ideal. Symptoms of angular leaf spot in cucurbit. Angular leaf spot of pumpkin. Note leaf ‘shot holes’. Angular leaf spot will first appear as, small water-soaked lesions which will expand until they reach a larger leaf vein resulting in the angular looking symptoms on leaves. Under heavy disease pressure, the bacteria will infect fruit causing small, water-soaked circular spots. 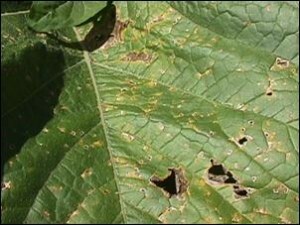 In many cases once weather conditions become dry again, infected tissue in leaves will die and fall out leaving the characteristic ‘shot hole’ symptoms. Control of angular leaf spot begins with the application of labeled rates of fixed copper plus mancozeb to help suppress the spread of the disease until hot, dry weather returns. 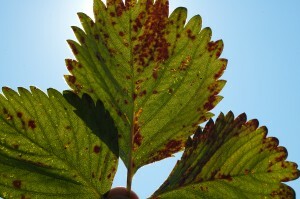 There have been a few reports of angular leaf spot (ALS) caused by the bacterium, Xanthomonas fragariae, in strawberry in the northern part of New Jersey. Often considered a minor pathogen, ALS can cause serious leaf and calyx infections ruining the marketability of fruit if left uncontrolled. Like all bacterium, the pathogen will infect leaves and the calyx through natural openings or wounds. Infections can often start in production operations and come in on infected bare root transplants or cuttings. 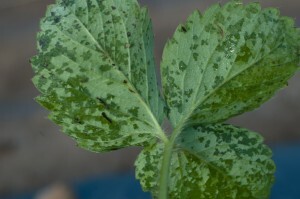 Symptoms on leaves include initial small, irregular water-soaked lesions (Figure 1). 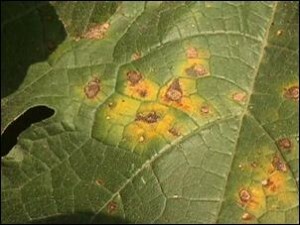 As disease progresses lesions will enlarge and coalesce forming reddish-brown spots on leaf surfaces which later become necrotic and translucent (Fig. 2). Holding infected leaves up to the light will reveal this diagnostic feature. Importantly, in severe outbreaks in the spring, the bacterium can spread to fruit causing the calyx to turn brown and dry out ruining the marketability of infected fruit (Figs. 3 & 4). Fig 4. 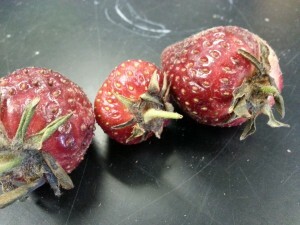 Strawberry fruit infected with Angular leaf spot. Note the brown, dried up calyx. 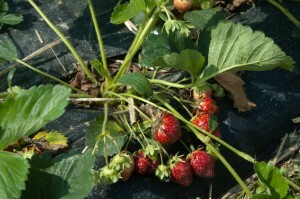 The pathogen is easily spread via overhead irrigation and during rain and can be moved around the field during harvest. The bacterium may overwinter on infected plant debris buried in the soil for up to one year. The best method for controlling angular leaf spot is to buy clean transplant material. Conventional or organic copper-based products can help suppress the development of ALS, and should be applied at a low rate to avoid phytotoxicity in leaves. Weekly, preventative applications of 0.3 lb fixed copper have been shown to be effective in reducing ALS if applied early enough when disease pressure was still low.